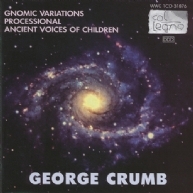 On reading the title Gnomic Variations, lovers of piano music might fancy themselves to be in a kind of "Grieg's World," but the truth is far from it: the title of the piano solo, completed in 1981, does not refer to any thieving Irish gnomes but solely to the conciseness of the structure of the work. "Gnomic" here means expressing an idea in brief words, or, simply, describing a maxim as accurately as possible. The Gnomic Variations consist of three parts, comprising a total of 18 variations. Although the pianist obtains the sounds also from the innermost part of the piano, directly from the strings, the instrument is nevertheless not prepared – thus the effects have to be generated new in each instance. Processional (1983) derives its force from the contrast between structure and tone color, with no or only few alternative styles of play being allowed. And the five songs (and two instrumental intermezzi) in Ancient Voices of Children (1970), Crumb's intricate and colorful adaptation of poems by Lorca, involves not only both a boy-soprano and a mezzo-soprano but instruments as unusual as a toy piano, a harp or a musical saw.